Google has today announced that it will be closing down support of its Google Toolbar for users using Firefox version 5 and above. Instead of using the Google Toolbar, Google now offers a list of plugins that should provide a similar functionality. So if you use Firefox version 5 or newer, you will no longer be able to use Google Toolbar and now Google Toolbar for Firefox is only compatible with Firefox version 4 or older. You can view a list of all the available plugins Google suggest you install to fill the gap left by your Google Toolbar here in your Firefox browser. First of all, we’d like to thank all of our loyal users of Google Toolbar for Firefox. We deeply appreciate all of the feedback over the years that helped to make the product so useful. As we all know, over the past few years, there has been a tremendous amount of innovation in the browser space. For Firefox users, many features that were once offered by Google Toolbar for Firefox are now already built right into the browswer. 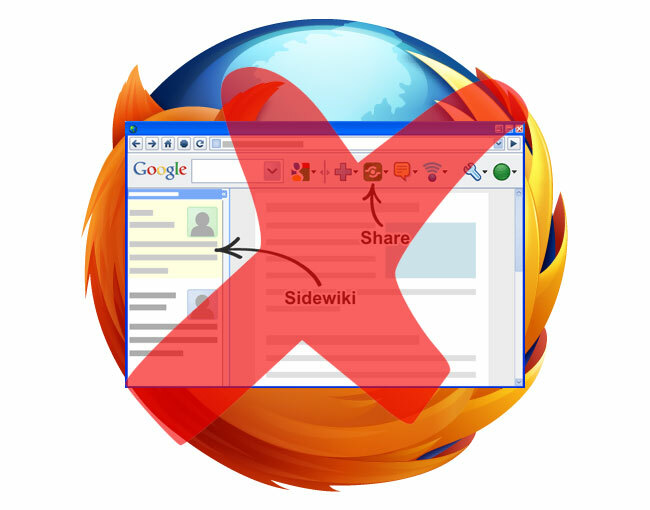 Therefore, while Google Toolbar for Firefox works on versions up to and including Firefox 4 only, it will not be supported on Firefox 5 and future versions.